I am continuing my visits to artists who will be exhibiting at this year’s Lexden Arts Festival, and yesterday Graham and I drove up to the very pretty small mid-Suffolk town of Debenham. The jeweller, Mike Carpenter, owns a small gallery next to his house in the High Street called Spiral Gallery (46 High Street). 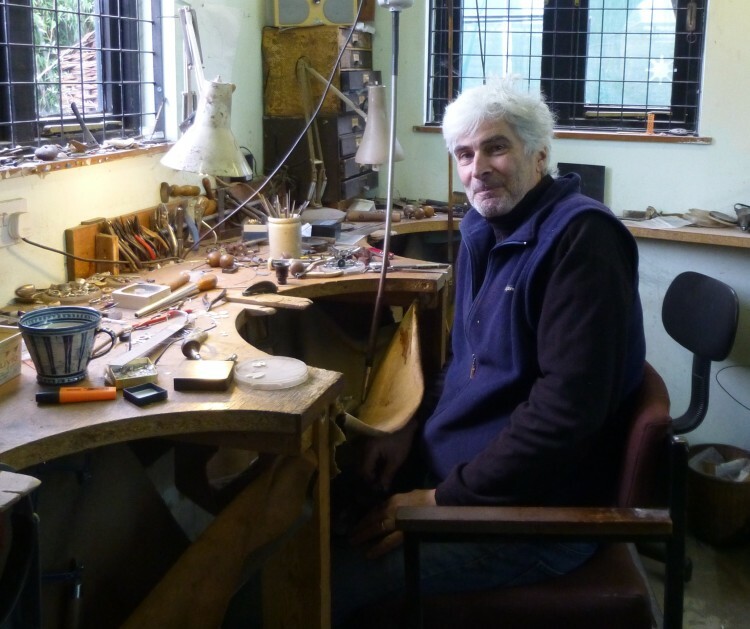 The gallery is packed with jewellery – not just Mike’s, but by other jewellers whose work he admires – and also textiles, ceramics, paintings and cards. It was buzzing with activity as different customers came in to browse, discuss commissions and collect work. We had a look round until Mike was free, and I particularly liked the quirky work by Jill Stewart. Behind the gallery space Mike has his office and studio workshop, which is full of interesting tools and work in various stages of completion. It was good to see Mike again, as we got to know him last year when he exhibited with us for the first time, and we quickly talked through all the details for this year’s exhibition. I’m really looking forward to seeing the work he brings us at the end of April – I know it will be beautiful! Don’t forget you can see all the events at this year’s Lexden Arts Festival, as well as the other artists who will be exhibiting, by going to www.lexdenartsfestival.org.uk Tickets for the evening events and the textile workshops will be going on sale on 1st April, which is not that long now!